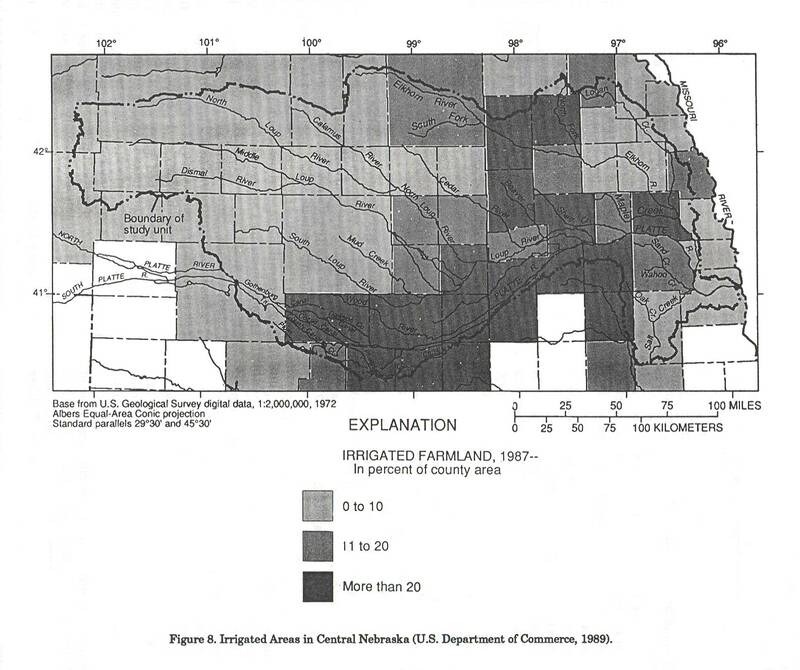 The Central Nebraska Basins study unit, shown in Figure 1, includes the Platte River and two major tributaries, the Loup and Elkhorn Rivers (Huntzinger, 1991). It is one of 60 study units in the U.S. Geological Survey's National Water-Quality Assessment Program (Huntzinger, 1991). The goals of the program are to describe the status and trends in the quality of a representative part of the Nation's streams and ground water and to provide a sound scientific understanding of the natural and human factors affecting water quality. Design of a water-quality assessment generally considers the characteristics of the hydrologic system because components of the system and their interaction determine the similarities and differences in water-quality conditions throughout a basin. An effective regional water-quality assessment strategy is based on environmental setting, which incorporates many interrelated features (for example, physiography, geology, hydrology, water use, and land use). 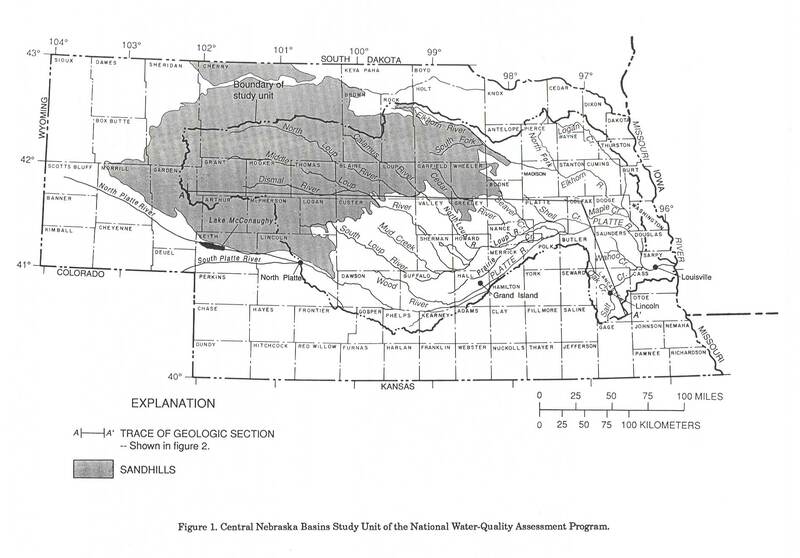 This paper describes the environmental setting for the Central Nebraska Basins. A particular environmental setting is characterized by specific combinations of hydrologic, geologic, phys­iographic, water use, and land use characteristics that may affect water quality. The potential for contamination of surface and ground water may relate to specific combinations of these characteristics. Therefore, environmental setting may explain regional water-quality similarities or differences. The Central Nebraska Basins study unit, originally prairie land, is composed of a wide river valley where the underlying ground water has served as a major water supply for production agriculture and small urban communities. Ground-water development for irrigation has increased the productivity of agriculture in the valleys and uplands. Most of the land in the northwestern part of the study area is not suitable for crop production and is a sparsely populated area used for livestock production. The Platte River is formed near the town of North Platte in western Nebraska by the confluence of the North Platte and South Platte Rivers. Its generally eastward course downstream to its mouth at the Missouri River is over 300 miles through a broad valley that varies from approximately 1 mile to more than 10 miles wide. The Platte River is a braided, sand-bottom stream with many islands, some having an area of several square miles. The valley is bounded by unconsolidated terrace materials except down­stream near the mouth of Salt Creek where it narrows and is incised into the bedrock surface. Flows of the Platte River are controlled by reservoir operations on the North Platte River in Wyoming and Lake McConaughy (since 1941) near the mouth of the North Platte River in Nebraska upstream from the study unit (Bentall et al., 1975). The South Platte River in Nebraska is influenced primarily by irrigation return flows at low flows. Flood flows on the South Platte River in Nebraska are not influenced significantly by reservoirs which are only in the upstream reaches of the basin in Colorado. Tributary drainage to the Platte River is mostly from the north. The nearly 30,000 square miles of Platte River drainage in the study unit include about 15,000 square miles from the Loup River, 7,000 square miles from the Elkhorn River and about 1,650 square miles from Salt Creek (Bentall et al., 1975). The Loup River and its major tributaries originate in the Sandhills, a region of steep grass covered dunes, and then flows through dissected plains with broad, often vaguely defined valleys (Bleed and Flowerday, 1990). Permeable soils and subsurface materials in the Loup River basin provide consistent flows and little if any runoff. The Elkhorn River, in the eastern and northeastern part of the study unit, flows through rolling hills, and well-defined valleys of stable glacial material except where it originates in the Sandhills (Figure 1). Runoff (yield per unit area) in the Elkhorn Basin is the largest in the study unit because of the steeper slopes and fine-grained soils developed from loess deposits of the northeastern part of the study unit (Bentall et al., 1971). Salt Creek is the only significant tributary flowing into the Platte River from the south. Salt Creek has two distinguishing features; its watershed contains the only urban area, which is Lincoln, Nebraska, with a population of more than 200,000 (U.S. Department of Commerce, 1989) and its source of base flow is shallow ground water, which locally has large concentrations of dissolved solids (primarily sodium chloride). Characteristics of subsurface material vary within the study unit, and differences in water quality could be attributed in part to these variations. Aquifer materials in the study unit include deposits of Cretaceous, Tertiary, and Quaternary age that are hydraulically connected. Variations in lithology effect the ground-water flow system and, in combination with depth to the water table, affect ground-water vulnerability to contamination. The Ogallala Formation and the underlying Arikaree Group make up the deeper part of the flow system in the western two thirds of the study unit (Figure 2). Quaternary, alluvial, eolian, and glacial deposits are present above the Ogallala Formation (Figure 2). There are no extensive confining layers between these formations, and the main hydrogeologic differences are in hydraulic conductivity. 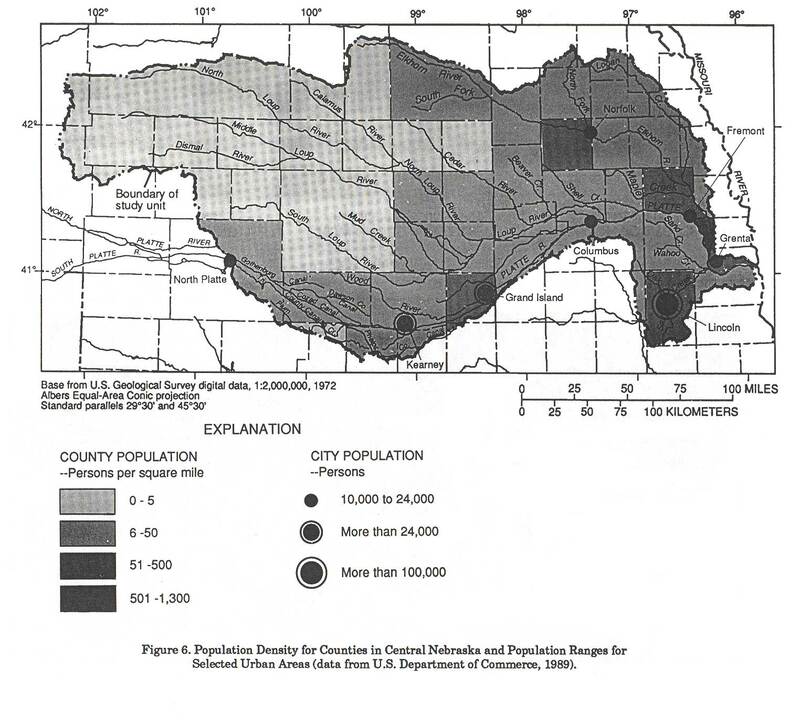 The hydraulic connection between the Ogallala and adjacent formations resulted in the name "High Plains aquifer" (Gutentag et al., 1984), which extends through the entire study unit except the Salt Creek watershed, the Platte River watershed downstream of the mouth of the Elkhorn River, and the east side of the Logan Creek watershed (see Figure 3). In the western part of the study unit, the depth to the Arikaree Group is generally more than 600 feet, and there are no known wells that are completed in that unit. In test holes, the contacts between the Arikaree Group, Ogallala Formation and deposits of Quaternary age are determined by lithology and the color of the sediment. The Ogallala Formation underlies a large part of the study unit (Figures 2 and 3) and is lithologically more variable (both vertically and horizontally) than the underlying Arikaree Group or the overlying deposits of Quaternary age. 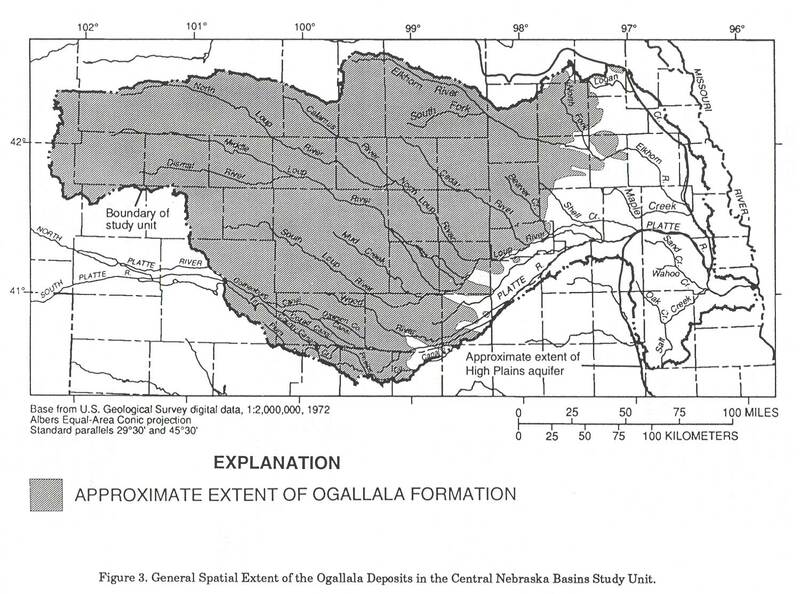 Generally, the Ogallala Formation becomes finer grained toward the east and northeast, and in northeastern Nebraska, much of the Ogallala is clayey silt. 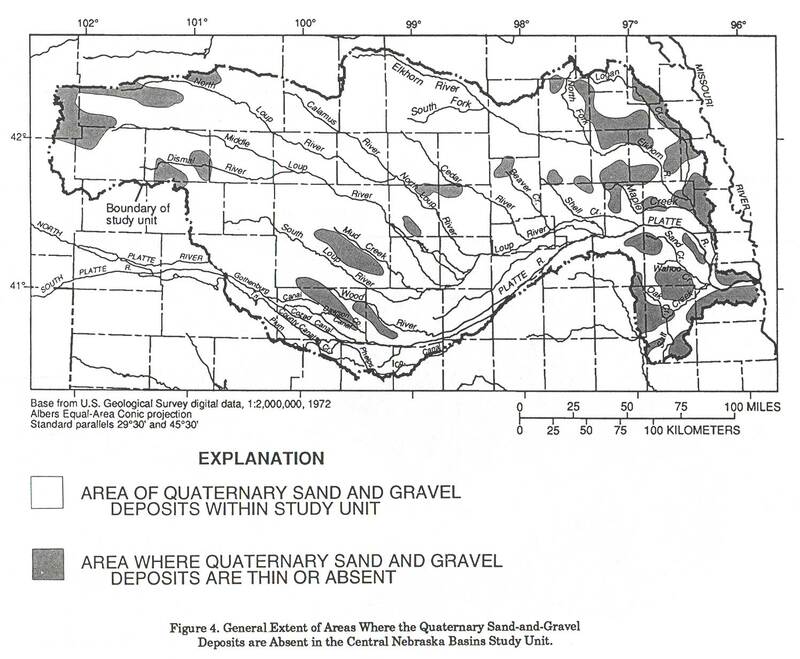 Although there is hydraulic connection between the Ogallala and the overlying units, locally basal deposits of Quaternary age containing thin clayey silt or silty very fine grained sand may cause semiconfined conditions. 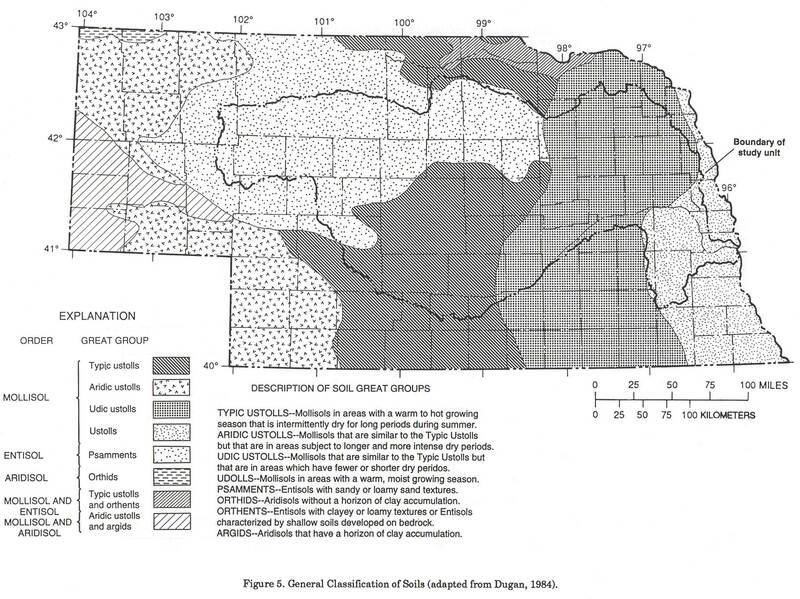 Low permeability glacial-till deposits occur in the subsurface of the Elkhorn River and Salt Creek drainage basins in the eastern one-third of the study unit (Figure 1). Deposits of sand and gravel of Quaternary age contain aquifer materials of limited thickness and extent. The deposits can occur within existing stream valleys or can interfinger with till deposits. The underlying Dakota Sandstone of Cretaceous age contains aquifer materials of variable thickness and transmissivity, and in some places the ground water contains large concentrations of dissolved solids. The alluvial sand-and-gravel deposits of Quaternary age are widespread, and they are probably the most important source of ground water in the study unit (see Figures 2 and 4). These deposits are not necessarily related to present-day streams; they occur wherever a river deposited sediments during the past 2.5 million years. Therefore, these extensive alluvial sand-and-gravel deposits are common beneath upland areas and alluvium of present-day rivers. For example, the Quaternary sand-and-gravel deposits that occur under much of the Platte River valley in central Nebraska extend laterally across the Platte­Republican drainage divide to the south and the Platte-Loup drainage divide to the north. The Platte River cut a valley through surficial deposits until it intercepted the underlying Quaternary sand and gravel deposits. Most of the alluvial deposits attributable to the Platte River are the fine sand in the river channel and sandy silt on terraces. The river has not had the energy to cut into the underlying coarse-grained Quaternary sand and gravel deposits. The grain size of the Quaternary deposits generally decreases from west to east. Deposits are often sand and medium-to-coarse gravel in the western part of the Sandhills and gravelly medium-to-coarse sand in the glaciated area of eastern Nebraska. In the glaciated area, alluvial sand-and-gravel deposits often underlie, interfinger with, and overlie erosional remnants of till deposits that vary in thickness and areal distribution. Locally the shallower sand-and-gravel and till deposits are hydraulically connected with the underlying Dakota Sandstone. In parts of Knox, Pierce, Cedar, Madison, Wayne, and Stanton Counties, where the sand and gravel deposits are thin or missing, the Ogallala is present directly under glacial till. The study unit has an abundance of productive soils. Large areas have soils well suited to cultivated crops whereas other large areas are not suited to crops but to productive grasslands (Elder, 1969). Parent material from which soils were developed is primarily eolian (wind deposited) sand, silt and loess. Vegetation present during soils development has been almost entirely prairie grass. Organic matter content increases from west to east as the grasses become progressively taller with the increase in annual precipitation. Soils in the study unit are considered youthful, having developed in deposits that are late Quaternary age or younger, and are not extensively or deeply weathered. 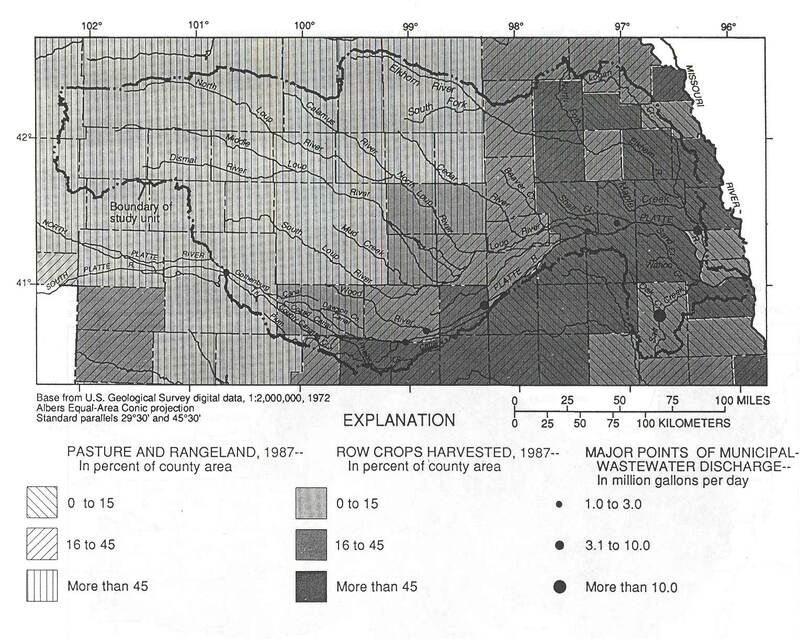 Soils have been classified in Nebraska by the Soil Conservation Service and summarized by Dugan (1984). Entisol soils dominate the Sandhill rangelands in the west and Mollisols dominate the crop and pasturelands in the central and eastern parts of the study unit (Dugan, 1984). 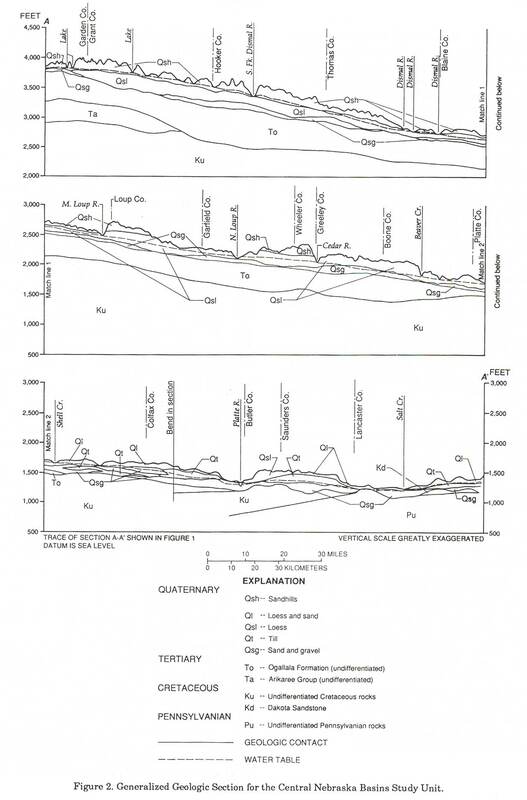 A summary of the soil classifications in the study unit is shown in Figure 5. The population distribution in the study unit reflects the dominance of rural areas, where most of the towns and small cities have less than 10,000 people (Steele, 1988). Population density in each county (Figure 6) varies from less than five persons per square mile to over 500 persons per square mile. Some of the counties with population densities exceeding 50 persons per square mile include an urban area of more than 24,000 people. The portion of the county along the eastern boundary that has a density of more than 500 persons per square mile is influenced by the Omaha suburban area, which has a population of more than 300,000, and is located immediately to the east of the study unit near the mouth of the Platte River. Counties that are primarily cropland agriculture without urban areas have population densities of 50 persons per square mile or less. Areas in the west that are primarily rangeland have population densities of less than five persons per square mile. Seven municipalities have wastewater discharges between 1 and 10 million gallons per day (see Figure 7). Lincoln is the only community that discharges more than 10 million gallons per day (U.S. Department of Commerce, 1989). The land is predominantly used for agriculture, typically native grasslands, pasture and rangeland (native grasslands) or croplands of row-cropped feed grains as shown in Figure 7 (U.S. Dept. of Commerce, 1989). Rangeland dominates in the northern and western parts of the study unit. The amount of the county that is cropland increases from less than 15 percent in the northwest to more than 45 percent in the east. Pasture and rangeland decreases from more than 45 percent of the county area in the northwest to less than 15 percent in the east. More than 20 percent of the total land area is irrigated in the Platte Valley, and in the south-central part of the study unit. Less than 10 percent of the land area is irrigated by ground-water withdrawals or surface-water diversions in the northwestern and eastern parts (Figure 8).